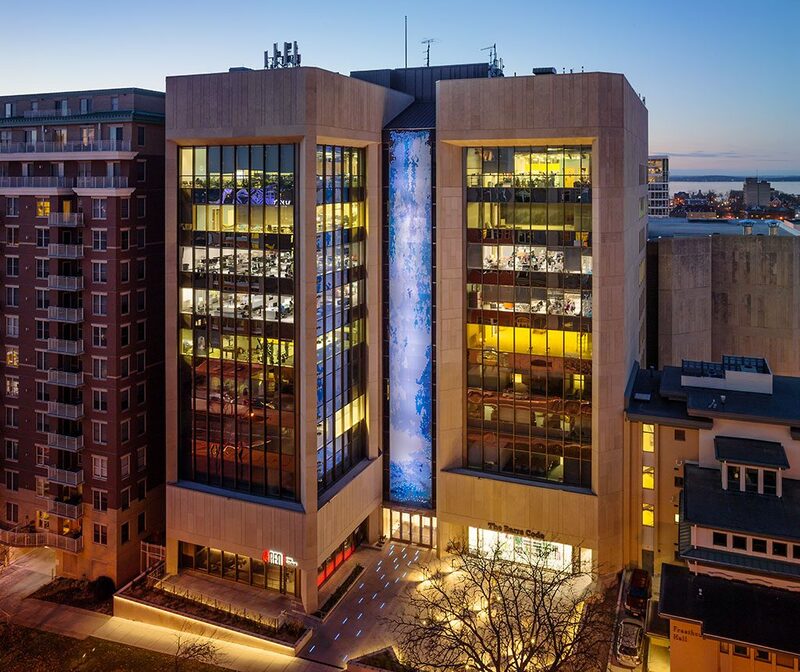 Downtown Madison has a new iconic mural – Electric Waterfall – created by Houston-based artist Jonathan Brown of Modern Mosaics. The mural was completed earlier this month, and we were proud of being part of the project, documenting the installation process of the mural. Update (12/22/2016): The video “The Making of Electric Waterfall” was selected by CODAworx as one of the top 10 “Process” art videos in this week’s edition of the CODAvideo Magazine Editions. Electric Waterfall consists of 60 panels, each 8 feet by 4 feet. The finished dimensions are 16 feet wide and 120 feet tall. It covers the middle part of the AT&T Building at 316 W Washington Ave. It utilizes nearly 500 LED nodes, 25 LED strips embedded in the ground, and 15 theatrical spot lights to create an illusion of falling water. The color of lighting would change based on season or local events. Jonathan and his team spent nearly a year creating these panels in his studio since last fall. The installation of the mural started in late October this year. The project involved many people and companies, including CODAworx, CG Schmidt Engineers, Pierce Engineers, Dimension Madison Design Group, H&H Electric, Starlite Productions, and Artemis Fine Art Services, among many others. In collaboration with Larry Lines of Studio Iguanamonk, we made the following video – The Making of Electric Waterfall. Larry took video footage at Jonathan’s studio in Houston while they were creating the panels, and we photographed and filmed the installation process here in Madison. I then put everything together and composed the music. Hope you enjoy the video! For additional information, please visit the project page on CODAworx. Copyright © 2015 &dash; 2019 Snowforest All rights reserved.